Jake Robinson never set out to create the next big music festival. Heck, the Kalamazoo-based luthier just wanted to play music with some of his friends then go back to making guitars for them. However, the Hoxeyville Music Festival had plans of its own. 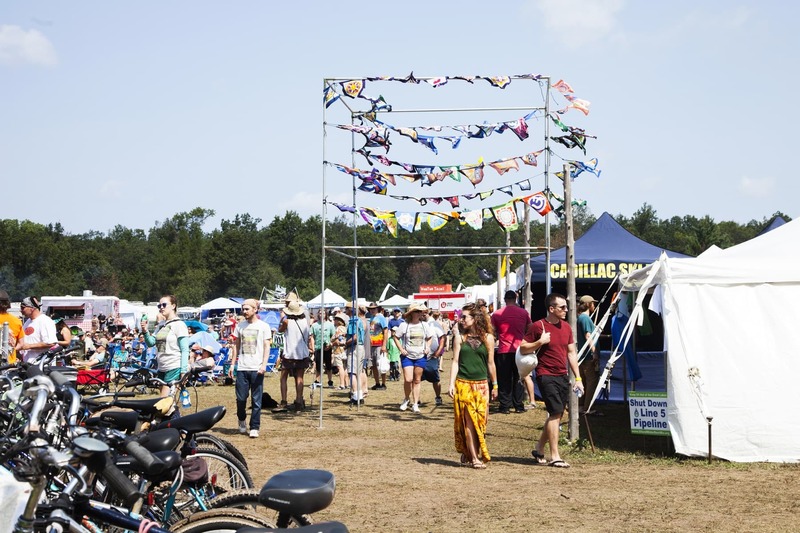 Now in its 16th year, the Northern Michigan festival, set for August 17–19, has graduated from that first informal get together to three days jam-packed with music. Jam being the operative word, as the jam-band scene is well represented, and the musicians frequently cross-pollinate one another’s bands. “The original vision? There wasn’t a vision, just a lot of friends. We had a big jam session and a keg of beer,” Jake says. For the first few years, as the event slowly grew, it was held at Coyote Crossing Resort outside Cadillac. Then Jake got the urge to permanently escape Kalamazoo. He moved himself and the festival west of Cadillac to a 100-acre site near Wellston, just southeast of the intersection of M-55 and M-37. The festival grounds are near the Pine River, a scenic blue-ribbon trout stream and national wild river ideal for kayaking or canoeing. The wooded acreage of the Manistee National Forest offers numerous wooded camping sites and trails for hiking or biking. Of course, the focus of the weekend is music. Over the years, national headliners such as Ivan Neville, the Dirty Dozen Brass Band, and former Grateful Dead members Mickey Hart, Bill Kreutzmann, and Bruce Hornsby have taken the stage. It’s also been a chance to celebrate Michigan-made music, from Ultraviolet Hippopotamus to Luke Winslow-King to various entries from the Earthworks Collective. The latter will be represented in part this year with a Steppin’ In It reunion. “This band has always been about the sum of its parts,” says singer/guitarist Joshua Davis. “It’s like a family. The reason we’ve been able to keep it fresh and make music is there are no egos.” Joshua Davis, of course, became familiar to a national audience thanks to his appearance on NBC’s The Voice. Dominic John Davis is a regular in Jack White’s band. Other members come and go as they please. “I came to it as a solo artist. I still play with some of the guys on a pretty regular basis,” Joshua Davis says. Members of the group, solo and together, have been staples at the Hoxeyville Music Festival over the years. In addition to Steppin’ In It, this year’s roster includes Dawes, Leftover Salmon, Lindsay Lou, Billy Strings, the Infamous Stringdusters, Winslow-King—in all, more than two dozen artists and bands will take the stage. A special early show Thursday night by Full Cord is followed by three full days of music. Complete festival details, tickets, artist lineup and more are available online at hoxeyville.com.